When reviewing your budget, you should always be trying to find ways to optimize your budget and figure out ways to save a few more dollars. I’m not meaning to squeeze that last dollar of savings on your water bill by not flushing your toilet, but looking for places where you can truly make an impact. The cellphone and especially the smartphone has been a hugely useful invention, but it has also added an entirely new “required” budget item in most people’s monthly expenses. Whether you go with Verizon, AT&T, Sprint, or T-Mobile (though T-Mobile has some excellent pre-paid options) you aren’t really going to see any huge differences on pricing by yourself, and I find it crazy that people find it acceptable to pay $150+ a month for a smartphone plan for their entire family! My solution? Turn to a much cheaper MVNO, and one that I highly recommend is Ting Mobile. 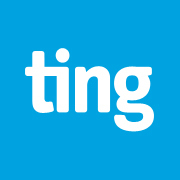 Ting is a MVNO (Mobile virtual network operator) that runs off Sprint’s network, basically renting out their towers and reselling the service to us. As an added bonus they also use Verizon’s network for roaming on voice and text, but sadly not for data. Without having to spend money on the network infrastructure they are able to offer lower prices, and Sprint makes some extra money from customers they probably wouldn’t have had in the first place. It ends up being a pretty sweet agreement for both parties as long as Sprint doesn’t provide too many restrictions. Now there are quite a few of these MVNOs floating around, so what exactly sets Ting apart from their competitors? I believe that there are two qualities that make them worthwhile to take a look at: 1. Their pricing model is based on your use. No longer do you have to pay for 700 minutes, 1000 minutes every month when you are only using 200 minutes each month. Whatever “bucket” you fall in for that month is what you end up in. Same thing applies for both texting and data. 2. Their customer support is simply amazing/unheard of. Every time you call in there is rarely a wait, and you always talk to a real person that is actually trying to help you. If talking on the phone isn’t really your thing, their email support has proved to be just as great. If the person you are speaking with doesn’t have a solution themselves, you can bet they will try their hardest to find someone who can work towards a solution. Now after all these compliments, you would think that I’m an avid customer of Ting, right? Well not quite (yet! )…but my girlfriend made the switch about 6-7 months and I helped her research who to switch to. Before this, we had no idea that phone companies like Ting even existed. She was paying around $70 for the smallest amount of minutes, unlimited texting, and the smallest amount of minutes allowed with a smartphone through AT&T. For her switch to Ting, she went with a used HTC EVO 4G LTE, which is a solid mid-range smartphone at this point in time. 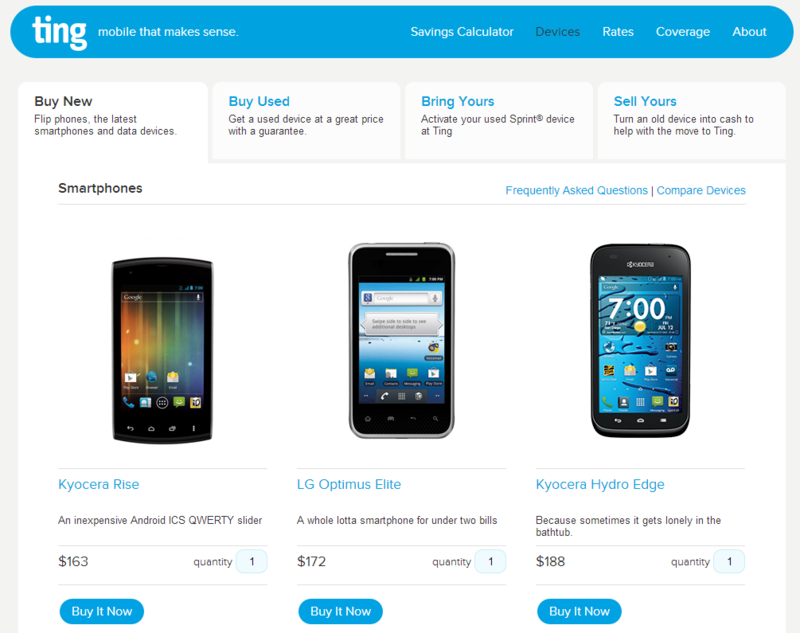 The cost of the phone was $175 off of ebay, and Ting has a section on their website where you can buy/sell devices too. You can either bring your own sprint device (which she did) or for newer model phones, you can buy them directly from Ting. Usually there is a 1 year exclusivity period on Sprint for new phones before they allow Ting users to bring over used Sprint devices. We didn’t have any problems setting up her phone, the documentation on the website was pretty straightforward and worked smoothly. My girlfriend did forget to click on a referral link while setting up her new account, but she was able to send an email afterwards and get the discount applied automatically! Since she has wifi the majority of the time at school and work, her data usage is very minimal. For texting me and some of her friends that she talks to often, she utilizes Google Voice and VoIP phone app that allows her to cut down on her minutes and texting usage even more. Her highest bill through Ting has been only $38, and usually she is averaging just under $20 a month now! That’s close to a savings of almost $30-$40 a month and the longer she keeps her phone the more her savings will pile up compared to what she was paying on AT&T. She’s had no real complaints about the Sprint coverage in our area, and she even helped her grandma switch over from AT&T to Ting. When she had a billing issue, she was able to call in and receive prompt help and the issue was quickly resolved. Almost everything she has said about this whole experience and Ting in general has been positive. Ting is definitely not for every user though, as some people will not really see savings through switching to them. If you are someone who needs to have the latest and greatest phone, you will probably not save money from Ting. They are only able to offer unsubsidized phones that can cost upwards of $500+ which will probably average out in the long run. They will also not benefit any power users, especially heavy data users. Their data charges are the most expensive and if you are not fine with limiting your data use and using wifi, Ting is not for you. You will also have to remember that Ting runs off Sprint’s network which at the moment is not nearly as good as Verizon’s and AT&T’s, and though it is quickly improving, you will need to check how the service is in your area. You can do this through Sprint’s official maps as well as checking out Sensorly maps to see where user’s have mapped Sprint coverage. If you are still interested in checking Ting out, my girlfriend has a referral link that will save you $25 on either your device purchase or your first bill and also give her a similar discount on her next bill! 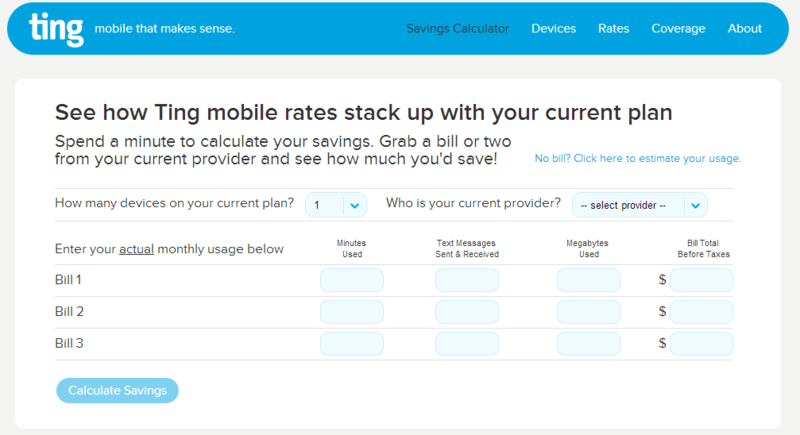 Ting even has a nifty calculator on their website that will allow you to see your estimated savings from switching to them.